This is arguably the most alarming weekly list so far. A plot that has played out week-by-week as Trump alienated our allies while cozying up to authoritarians, followed by his embarrassing behavior at the NATO and G7 meetings, culminated this week at the G20 with US isolationism. This video https://goo.gl/VR1zxi, which traces weekly not normal items, explains why Putin is the winner in this new world alignment. This week Trump amped-up his assault on the media, including encouraging violence. With this, Trump has distracted the country and media, and taken back the narrative. In the atmosphere of chaos, this week also stands out for the number of important stories that received little or no media coverage. By midweek, 44 states and DC refused to provide some or all of the voter roll data requested by Trump’s Election Integrity Commission. States are denying the request based on concerns over privacy and federal overreach, and also concern that the effort of identifying voter affiliation will be used to purge Democrats from voter rolls. The Lawyers’ Committee for Civil Rights Under Law filed a Hatch Act complaint against Kobach, saying he used Trump’s commission to solicit political campaign money. A Maryland official, Deputy Secretary of State Luis Borunda, resigned from Trump’s commission. Several experts on the regulatory process told The Hill that Trump’s commission may have violated the law by failing to submit the requests to states through OIRA, as required by the Paperwork Reduction Act. A DOJ letter sent to 44 states’ election officials on the same day Kobach and Pence made their requests asks states to detail their compliance with the NVRA. This request also raised concerns about voter purging. On Sunday, Trump tweeted a video created by a Reddit user from both his personal account and the official @POTUS account, showing him violently wrestling down a person whose face is the CNN logo. The Reddit user was named “HanAssholeSolo” and his posts were full of anti-Muslim, anti-Semitic, and other white supremacist materials. The Reddit user later apologized, but Trump did not. The parents and wife of the CNN reporter who covered the story received around 50 harassing phone calls. Allegedly, CNN did not defend the reporter. As Trump continued his anti-CNN rhetoric, the cable network’s anchors and executives received death threats and other harassing messages. Following Trump’s tweet, three media watchdog groups have started to do something they never imagined: documenting violent threats and actions against the media in the US. NYT reported the Trump regime discussed using the pending merger between Time Warner and AT&T as leverage over CNN. On Thursday, Trump media ally Daily Caller reported the WH doesn’t support the merger if Zucker still heads CNN. Trump ally and Bannon patron Bob Mercer bought 2.5 million shares of Time Inc., owner of Time magazine, in the first quarter of 2017. Per Week 33, David Pecker, owner of National Enquirer is also interested in Time Inc.
Rachel Maddow reported that The Rachel Maddow Show was sent a forged NSA document. Maddow speculated this was an attempt to trick her show into reporting a false story, and hence weakening her credibility and dulling that storyline. Maddow said that other media outlets may also be receiving forged documents as well, citing recently retracted stories at CNN and Vice. Politico reported on the Trump regime’s obsessive crackdown on leaks from the intelligence community, which has led to an “increasingly tense and paranoid working environment” in the national security community. On Sunday, protesters gathered at rallies in dozens of cities around the country to call for Trump’s impeachment. NBC reported that in Trump’s first 168 days in office, he spent 50 days at Trump properties and 36 days at Trump golf resorts. NYT reported that while working with industry players, not EPA staff, Pruitt has moved to undo, delay, or block 30 environmental rules, a rollback larger in scope than any other in the agency’s 47-year history. Several states sued over the EPA’s decision to keep a Dow pesticide, which studies show can harm children’s brains, on the market. Per Week 33, Dow spent millions lobbying and donated to Trump’s inauguration. The Wisconsin assembly passed a bill which would block students from protesting conservative speakers on college campuses. NYT reported the Trump regime’s latest anti-immigrant tactic is to target undocumented parents suspected of having paid to have their children smuggled into the US. Politico reported that Trump insider Stephen Miller has been holding meetings with agencies on how to further curb the entry of refugees. Miller clashed with Tillerson, who demanded autonomy. A new law in Florida allows parents and residents to file complaints with school boards to challenge what’s taught in science classes. Attorneys general for 18 states and DC sued DeVos and the Dept of Education over a decision to roll back rules put in place to help students who have been defrauded by their colleges. Devos’s Dept of Education may stop publishing the list of college and universities in violation of Title IX for mishandling campus sexual assault. The Obama Administration started the list to hold schools accountable for an issue which impacts 1 in 5 college women and 1 in 20 college men. WAPO reported the WH gender pay gap until has more tripled under Trump, with female staffers earning on average 63% of what their male counterparts make. This is the biggest WH gender pay gap in decades. In a 53 page memo to the court, Trump attorney Kasowitz argued for the dismissal of a sexual harassment lawsuit against Trump, claiming Trump cannot be sued in state court while in office. The Auschwitz Memorial condemned a political video posted by Louisiana Republican Clay Higgins, which the congressman filmed inside an Auschwitz gas chamber. At a protest outside Sen. Rob Portman’s office in Columbus, OH, a woman in a wheelchair was pushed out of her chair to the ground by a police officer. The KKK plans a rally in downtown Charlottesville today, and warned that many of its 80-100 members and supporters will be armed. Pro-Trump Twitter operatives are marketing their services to candidates and others, promising to mobilize their followers and networks for pay. Guardian reported investigators are looking into whether the Trump campaign and far-right websites coordinated with Russia in spreading fake news. Sen. Mark Warner noted key voters in swing states were targeted. Motherboard reported on an analysis of the Twitter bots that helped Trump, and found the same bots and alt-right narrative emerged in the French election against Macron. A new NPR/PBS NewsHour/Marist poll found Trump’s net approval with Independents has fallen by 17 points since he took office. The poll also found that the majority (54%) of Americans believe Trump did something illegal or unethical with Russia. While his predecessors Clinton, W. Bush, and Obama celebrated July 4th by visiting troops, Trump spent the day on a Trump-branded golf course. Senators John McCain, Elizabeth Warren, and Lindsey Graham visited troops in Afghanistan. Despite his recusal, Sessions spoke to Fox & Friends about the Trump-Russia probe, offering advice to Mueller on hiring practices and tempo. WSJ reported the Office Government Ethics will release an additional two dozen ethics waivers just filed for Trump regime members working on issues they handled in their private-sector jobs. Trump has already granted as many waivers to WH officials as Mr. Obama did in his eight years in office. The State Department’s Office of the Inspector General said the State Dept and USAID have failed to adequately track more than $30 billion of foreign aid. In a survey of 35k employees in the State Dept and USAID, workers said they were concerned about the future of their agencies and the lack of support from the Trump regime and Tillerson. An Indiana nonprofit is suing Pence’s successor for keeping residents in the dark on the deal between the Trump regime and Pence with Carrier. The group’s request for information in December went unanswered. In another sign the Trump regime won’t take civil rights seriously, Trump nominated Eric Dreiband to the DOJ’s Civil Rights Division. Dreiband has spent his career defending companies from charges of discrimination. Walter Shaub, director of the OGE, resigned in frustration, six months before his term ended, saying, “It’s clear that there isn’t more I could accomplish.” Shaub and OGE have 24 items in The Weekly List. CREW filed an ethics complaint against Kushner, saying he failed to make the required disclosure of his ownership interest in Cadre. The online real estate investment company has a value of $800 million. The Russian sanctions bill, which passed in the Senate 98-2, stalled in the House as Republican Pete Sessions, chair of the House Rules Committee, said it would make American energy companies less competitive. WSJ reported energy companies including Exxon and Chevron, and other industries, are lobbying against the Russian sanctions bill, saying it would hurt their business with Russian partners. Trump Organization renewed more than 1k web domains, including many which refer to Trump and Russia, like TrumpTowerMoscow.com, indicating possible interest in future development. Axios reported that Russian government-owned Sputnik news is coming to the DC airwaves after taking over a FM radio station. The FCC has not yet been notified according to a spokesperson. Matt Tait, who is cited in the WSJ story on possible Trump campaign collusion with Russia on Hillary’s deleted emails, wrote an op-ed, “The Time I Got Recruited to Collude with the Russians,” to tell his story. Tait also received a document titled “A Demonstrative Pedagogical Summary to be Developed and Released Prior to November 8, 2016,” which list four groups involved, including group one which listed: Bannon, Conway, Clovis, Flynn, and Lisa Nelson. McClatchy reported on a Kremlin document that shows Kaspersky Lab, a leading global seller of anti-virus programs, has ties to Russia’s spying apparatus. Kaspersky’s certification has a FSB military intelligence unit number. Kaspersky security software is available globally, including at Target and Walmart. The company also serves as a subcontractor for US federal software contracts, and was used by the DNC last summer. CNN reported that Russia is stepping up spying efforts in the US post the US elections. Officials cited said Russia feels emboldened by the lack of a significant retaliatory response by Trump and Obama. US Intelligence estimates that Russia has 150 operatives in the US. Since the election, many have tried to sneak in under the guise of business. Strangely, the State Dept reportedly continues to grant temporary duty visas to suspected Russian intelligence officers, despite this knowledge. AP reported on a lawsuit filed by Coalition for Good Governance, saying Georgia’s 6th Congressional election results should be voided because of previously identified problem with the touchscreen voting system. The suit cites the work of a private cybersecurity researcher who found that a misconfigured server had left Georgia’s 6.7 million voter records exposed to hackers last August. WSJ reported that Mueller has hired an “absolute cream of the crop” team of 15 top attorneys with experience in national security, public corruption and financial crimes for the Russia probe. FT reported Russian-born Sater has agreed to co-operate with an international investigation into a money-laundering network. Per Week 32, Sater has extensive ties to organized crime and the Trump family. In their campaign for the upcoming election, Merkel’s party has dropped the reference to the US as a “friend.” Four years ago, her party referred to the US as Germany’s “most important friend” outside of Europe. Bloomberg reported China and Germany have stepped up to lead this year’s G20 summit, a role formerly held by the US. Pew Research found that 17 of the 19 G20 countries in their survey look to Merkel, not Trump, to lead in world affairs. Guardian reported Trump considered a sneak visit to Downing Street in order to avoid massive UK protests en route to or from the G20 summit. After the story broke, the WH said Trump would not visit. Instead, on his way to the G20, Trump chose to stop off at Poland, despite the new far-right government’s authoritarian leanings including cracking down on judges and the media. AP reported the Polish government promised the WH cheering crowds as part of the invitation. Members of the ruling party and pro-government activists bussed in groups of people for Trump’s speech. Trump gave another of his dystopian speeches in Poland, saying Western civilization was at risk of decline because of “radical Islamic terrorism” and government bureaucracy. The day before Trump was set to meet with Putin, seemingly as a bargaining chip, The Moscow Times reported the Russian embassy to the US is accusing the US of “kidnapping” a man accused of cyber-fraud. LA Times reported that in preparing Trump for his meeting with Putin, aids had written a list of “tweet-length sentences,” which summarize the main points. Trump met with Mexico’s Pena Nieto at the G20. After the meeting, Trump was asked if Mexico will pay for the wall to which he responded, “absolutely.” Mexico’s foreign minister said the wall was not discussed. At the G20, Trump and Putin met for 2:16 hours off-camera, behind closed doors. The meeting was originally scheduled to last 30 minutes. Only Tillerson and Trump were present from the US side, despite media speculation that McMaster and Fiona Hill would be included. Lavrov and Tillerson gave different accounts of what happened behind closed doors. Lavrov said Trump told Putin some circles in America were “exaggerating” allegations of Russian interference in the US election. Russia faces no consequences from Trump for interfering in our election. It was unclear if Trump returned the two Russian compounds seized by Obama as punishment for Russia interfering in our election. 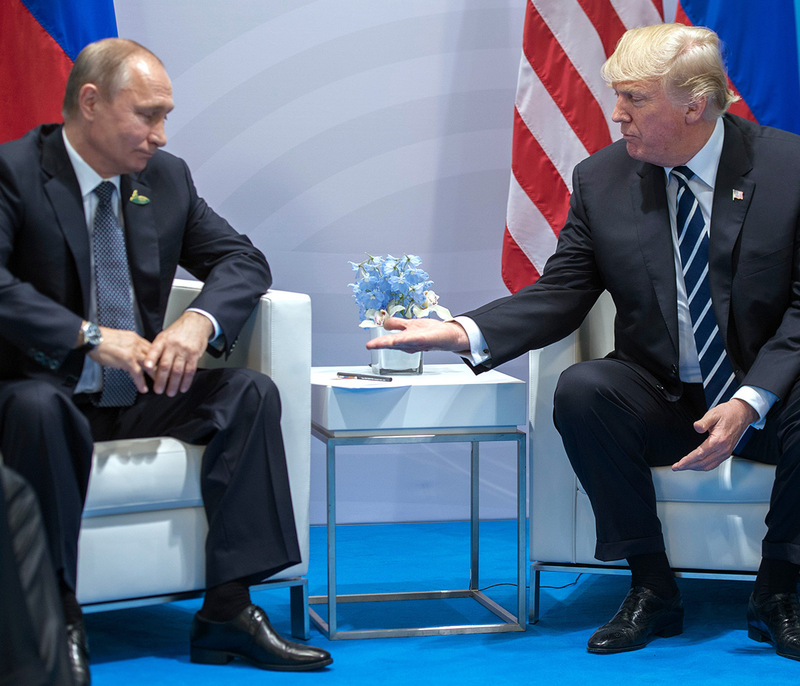 In an op-ed, “Trump Caves to Putin,” conservative journalist Stephen Hayes laid out an indictment of how Trump bowed to Putin on Russian interference and foreign policy. Elected Republicans however were silent. Ivanka took her father’s seat at a G20 meeting on Saturday. Normally, government ministers or senior officials would take such a role. Trump isolated the US from other G20 countries on a series of policies ranging from climate to free trade. The US abstained from signing onto the G20 communique on climate-related issues, the sole country at the summit to do so. An image shown on Russian media of Putin’s meeting with Trump at the G20. Putin delays extending his hand.